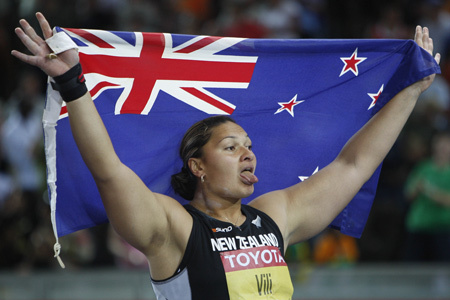 Reigning world and Olympic champion Valerie Vili from New Zealand took the title of women's shot put at the 12th World Athletic Championships in Berlin on Sunday. 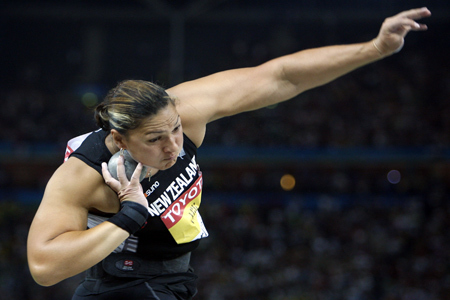 Vili boasted 20.44m to crown the event, host thrower Nadine Kleinert took the silver with personal best of 20.20m while China's Gong Lijiao pocketed the bronze with personal best of 19.89m. "I'm satisfied I could defend my title. Tonight the German girl pushed me a lot but I wasn't worried, we spent proper time preparing to get the right things done," said Vili. For the 25-year-old, 20.44m is still shy her world-leading 20.69m in May, but was enough to book the gold, also the first gold medal for her country at the 9-day tournament. For both Kleinert and Gong, the silver and bronze medals were a surprise. "This is the perfect evening for me," said Kleinert, who won thunderous applause from host fans for her best-ever performance. "I never thought that I could get the gold medal because I knew that Vili is too strong. But still, she took quite a long time to get in front," she added. Gong attributed her success to relaxed spirit in throwing. "I am very happy because of my result. It was also a little bit surprise for me. I felt relaxed - maybe too relaxed to put it even further," she said.